Well, what is there to say about all this? To start off with – the media. They have published nonstop over the last month or so about the costs. About the fences, and fake lakes, and cost of security, and number of security / police being brought in. They have really helped in getting the public angry at the government. Publishing the truth or not, you hear it everyday and you see people starving, homeless, treated unequally – and you start to wonder. The government said there was no money to feed it’s own people, yet here we are – spending like money is no issue. You have Toronto – homeless folks are being rounded up and hidden away in a newly built holding jail. You have a new lake. How much did this cost? Why not spend that on our already troubled lakes? Boarded up windows, and security. 77 new security cameras placed in the downtown core… where they were considering removing the already existing cameras. Police presence is felt by all. 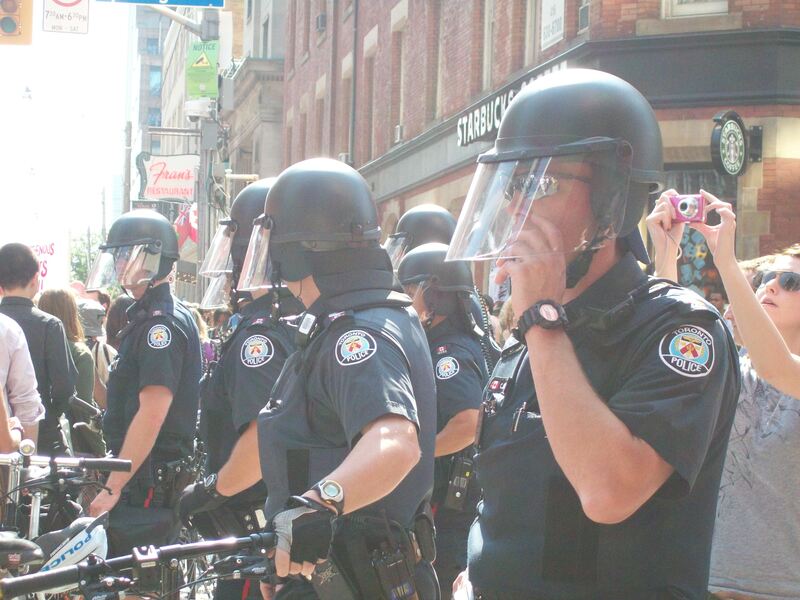 So now Toronto is becoming *tidy* and a police state. Enough to put anyone on edge. They remove garbage cans, bus booths, mail boxes. They take down trees, old trees. They build a fence around the area to be *protected*. Then they tell us we can’t travel in certain areas of our own city. We can’t use our cell phones in our city – they will be jammed. If you go anywhere, make sure you have ID. Don’t fly kites. Don’t take pictures. Reports of police smashing people’s cameras. All main attractions are to be shut down. The PATH is shut down. That’s an under the city walkway. It connects most of downtown through tunnels, with stores and such. Everyone knows that a G20 is THE place to protest. Some folks say that they shouldn’t have held it here. Why not? We want free speech and freedom, liberty, all that… why can’t they come here? Toronto WAS a peaceful place. Saying they should have gone elsewhere is the same as telling us where we can or can’t protest. So they tell the public that the only legal place they can rally is at Queen’s Park. A rally is held at Allan Gardens instead on Friday, and it’s peaceful – as are all the rallies and marches here, normally. The police are suddenly authorized to search you illegally. We got to the rally and they were going through everyone’s bags – one woman I was with is a hair dresser, they took her hair cutting scissors… her livelihood. They have the right to arrest you – without question and their word is law. Yep – no questions asked, if you are arrested within these two days – the police don’t even have to defend their side. You are wrong. End of story. They tell us that they can tear gas us, or pepper spray and that they have this sound, sonic boom thing. They get marginal use – there are rules behind using it, but they can if need be. You go on a peaceful march and the police surround you, put on riot gear and push forward into you. Intimidation? Do you think that people will just say, oh, ok…and go home? In Canada we are allowed to gather and be heard. It’s not illegal, well, it wasn’t until we got guests for dinner. I’m going to go get my coffee, I’ll be right back. Alright. I’m ready. So the next day, Saturday – you have the *legal* rally at the proper allocated location. It’s advertised as a family gathering put on by local unions. Great! Terrific! If the police behaved the way they did on Friday, then Saturday…well, I don’t need to say it. It’s all over the news. A splinter group goes off to wreak havoc. 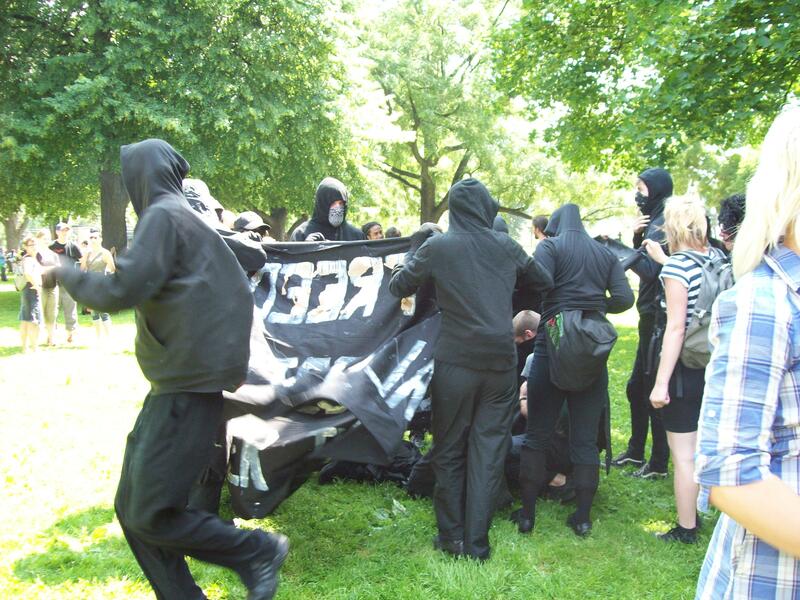 This group is well known as anarchists – Black Bloc. This group WAS in attendance on Friday. They were marching beside me at one point and I overheard the police discussing them. They marched in single file, all holding a piece of black cloth to hide behind, and they were dressed all in black, identities covered. The police had them on Friday. Maybe legally they couldn’t touch them on Friday, so they had to wait for something to happen first. But you would think they’d have been ready for this? Except that they were already given the power to arrest for no reason. This group breaks off from the main march (which had been described as a parade up to this point) and they begin destroying everything in their path. They are clearly seen all over the news, smashing, breaking, jumping on things, throwing things. Yes, they were violent. No, I don’t think they are from Toronto. People have traveled by the bus loads to get to Toronto for this G20 business. It would appear that about this time mob mentality took over… and they got followers. This went well into the night. The roar died down at about 3 am, with 480 people jailed. Perhaps it was the perfect forum for folks to finally display their anger at the treatment they’ve been receiving. I strongly believe that if the government provided no welfare whatsoever, and left folks to die in the streets that there would be a massive social uproar. Well, this IS the case. They are starving their people. People are homeless. Massive unrest is the only thing that will get their attention and bring about change. If folks sit quietly at home – hungry, alone – what change will occur? None. But if people rally together and fight for change, and get loud and strong enough, then change must come. We vote those politicians in and then they starve their people and refuse to hear them. They hold the G20 (top 30 folks, according to themselves) to decide our fates without hearing us. Without a shred of decency. All it comes down to is money. Big corporations. Bail out the big companies, but starve your peoples. The very people that put you in office. Two police cars set on fire. Why were they there in the first place – parked in the middle of the street for no apparent reason. Unattended. And who set the fires? After seeing the behavior of the police I certainly see this as a valid question. You get news coverage, the likes of Gord Martineau. He interviewed John Clarke of OCAP. Well, if you can call it that, but what he really did was attempt to bully and trample Mr. Clarke. He wouldn’t let him finish a sentence, and interrupted him in such a way that anyone else would have thumped him a good one. Then at the end of the so called interview, his eyes glazed over and with a disdainful and insincere look he thanked Mr. Clarke for his time. He did not, for one second, really want to hear what John Clarke had to say….he was there to pick a fight and place blame. Thankfully Mr. Clarke is no sissy, held his ground and even managed to get a word in edgewise. Ah, finished just in time. That was a great coffee! Get involved…. 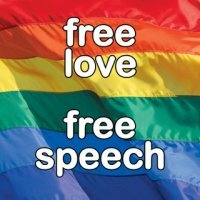 send an email – join facebook!